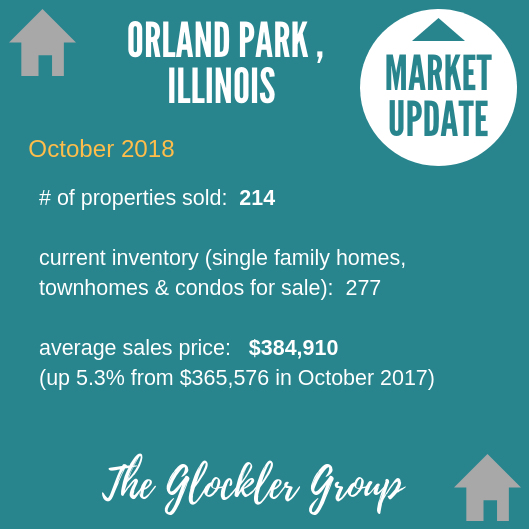 Hello, here is your October 2018 residential real estate market update for Orland Park, Illinois brought to you by The Glockler Group. October Property sales were 96, down -10.3% from 107 in October of 2017 and 2.1% higher than the 94 sales last month. October 2018 sales were at a mid level compared to October of 2017 and 2016. October YTD sales of 986 are running 2.7% ahead of last year’s year-to-date sales of 960. The Median Sales Price in October was $229,500, down -10.0% from $255,000 in October of 2017 and down -4.4% from $240,000 last month. The Average Sales Price in October was $249,754, down -10.9% from $280,256 in October of 2017 and down -6.7% from $267,687 last month. October 2018 ASP was at the lowest level compared to October of 2017 and 2016. The Total Inventory of Properties available for sale as of October was 277, down -12.1% from 315 last month and down -16.8% from 333 in October of last year. October 2018 Inventory was at the lowest level compared to October of 2017 and 2016, which can be beneficial for sellers. Thinking of buying or selling in Orland Park or the surrounding suburbs? 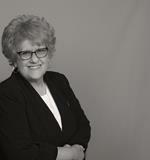 We have been helping home buyers and sellers for 40 years! What we offer clients is truly unlike any we know. Contact us today.